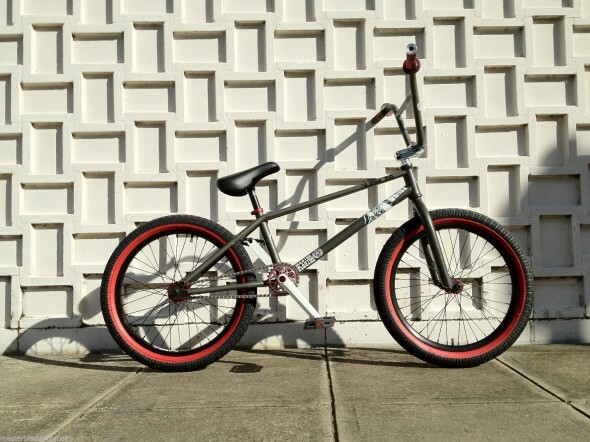 Check out this custom Subrosa DTT Street complete for sale at MASTER BLASTER PLANET! Subrosa “Pandora DTT” (Double Top Tube” custom BMX bike with 20.5″tt frame. Colors: Phosphate Raw w/ red and black components throughout. The frame, fork, and bars are all phosphate raw which is a dark grey color. This color is super rare and pretty much impossible to find! Please check the specs below for the full run down. Weight as shown is 24 lbs. Click the image above to view more photos, complete spec info, and to purchase this one of a kind machine now! Super rare 100% chromoly Subrosa Pandora DTT frame, fork, and bars with Shadow Torrid V2 three piece cranks, Subrosa Bandit 25t sprocket, Shadow Interlock V2 half link chain, Rant sealed bearing front and rear cassette wheel with 9t driver, with sealed Shadow MID bb, and sealed Subrosa Bitchin integrated headset. Also includes a Subrosa Forever stem with Banned stash cap, rare grey Shadow pedals with custom red detail caps, Shadow Solus Trey Jones mid seat, and Shadow Alfred seat clamp. This bike features some of the best components money can buy! « Subrosa DTT frames are selling out quick! Only a couple left in stock!